A company's brand is simply what a consumer thinks of a company and it's products. It represents a set of promises that a company makes to a consumer. Brand equity consists of assets and liabilities linked to a brand that change the value of a product. It can also be thought of as the value of the company if the firm's total asset value was subtracted from the firms estimated value. Building a brand can trump everything else in marketing, for better or for worse. Brands have the ability to create customer loyalty, lower competition, create larger margins, lower price sensitivity of products, create greater trade, create better communication effectiveness, and create brand extension opportunities. Many characteristics and features that augment a product, such as warranty time, can affect branding. Popular culture, influencers, customers, and the firm can influence the culture or story behind a brand. When differentiation is greater than relevance, the brand can grow. Otherwise, it cannot. When esteem is greater than knowledge, the customer will want a closer relationship. Otherwise, it will not. Brand strength is the combination of differentiation and relevance. Brand stature is the combination of esteem and knowledge. The definitions that follow describe the CBBE pyramid, and can be though of in terms of understanding nomenclature. To communicate an idea, sometimes certain words or phrases are used, and in the beginning, synonyms are the only way a person has of understanding what the initial words or phrases mean. The following definitions will be defined by their synonyms because it seems this is the most effective way to talk about these brand ideas. Brand Salience - Identity & awareness. It shows what basic functions the brand provides. It also allows the consumer to see new usage situations that were previously ignored or forgotten. Brand Performance & Imagery - Meaning & associations. Performance is all about functional needs. This includes quality, utility, asthetics, and economic needs. It includes primary and secondary functions as well as reliability, servicability (effectiveness, efficiency, and empathy), and durability. It also includes style, design, and price. Imagery is all about psychological and social needs. It is about user profiles, purchase scenarios, usage scenarios, personality, values, history, heritage, and experiences. Both Performance and imagery can be profiled by looking at three main categories: Strength, Favorability, and Uniquness in that order. Consumer Judgements & Feelings - The effects that the knowledge and product a company publicizes has on consumers. Quality, credibility, consideration, and superiority are judgement attributes. Warmth, fun, excitement, security, social approval, and self-respect are feeling attributes. 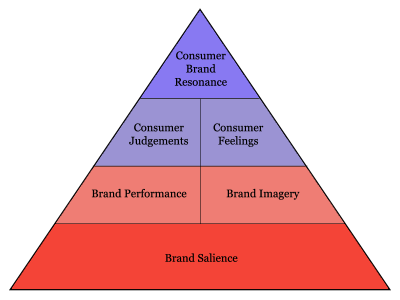 Consumer Brand Resonance - Brand loyalty. This means behavior loyalty, bonding attitudes, a sense of community, and active engagement. Another method used in gaining consumer insights is the ZMET (Zaltman Metaphor Elicitation Technique). This method has a consumer gather images about a brand or product, and then use those images to tell a story. Missed images, sensory images, and image groups are also discussed. This method's main benefit is removing the constraints on voice/language and the asking of specific questions in gaining insights. It helps consumers say what they want to without putting their ideas into words. The Link Between Consumers and Brands - A brand should help a consumer remember and understand the differences between a competitors brand and your brand. Brands must continually be built even if they are already strong. Competitive and consumer shifts can occur, and change everything. The time it takes to build a brand will be proportional to the time it takes to create enough awareness and understanding with consumers. In the end, it's what the consumer thinks that makes or breaks a firm.